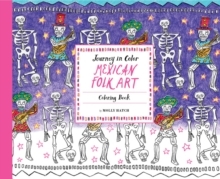 Featuring festive Mexican folk-themed designs with hot pink accents on every page, this gorgeous colouring book offers a delightful way to unwind. For this newest addition in the Journey in Color series, Molly Hatch lends her distinctive hand-drawn sensibility to outlines of cut paper art, sugar skulls and traditional Mexican hand crafts. Single-sided pages prevent colors bleeding through, making every design in this eye-catching book a completely immersive colouring experience.